In September of 2006 we made a short trip to southern Portugal, flying into Lisbon and renting a car to drive up to Coimbra and back while stopping at a number of scenic small towns in between. Overall the trip took 6-7 days. We stayed three nights in Lisbon exploring the city as well as taking a day trip to Sintra. Lisbon is a fascinating city with treasures around every corner. We took the bus out to Belem where there are a number of noteworthy sites, including the chance to sample one of the iconic foods of Portugal, Pasteis de Nata, or egg custard tart. Our BnB was located just off one of the main squares which made it easy to navigate the city. At night we looked for bars with fado singing, which we found in the Alfama neighborhood, the oldest neighborhood of Lisbon. We went to one cafe that had fado singing according to the guide book but for some reason they had canceled it that night. But when we asked the owner if there would be any singing, he was apologetic and said that after we finished dinner, he would take us to a place that he knew where we could experience it. We shared a table with a couple from Majorca who was also there for the singing. Oddly, the next evening as we were sitting at an outdoor table having dinner, who should come walking along but that same couple. In a city of several million, what’s the odds of that happening? We had a good chuckle over that. The town of Sintra, which is about a half hour from Lisbon, is one of the most popular tourist spots in the country. It has a number of famous and worthwhile sights: the Pena National Palace, the ruins of the Castle of the Moors, and the Palace of Sintra. 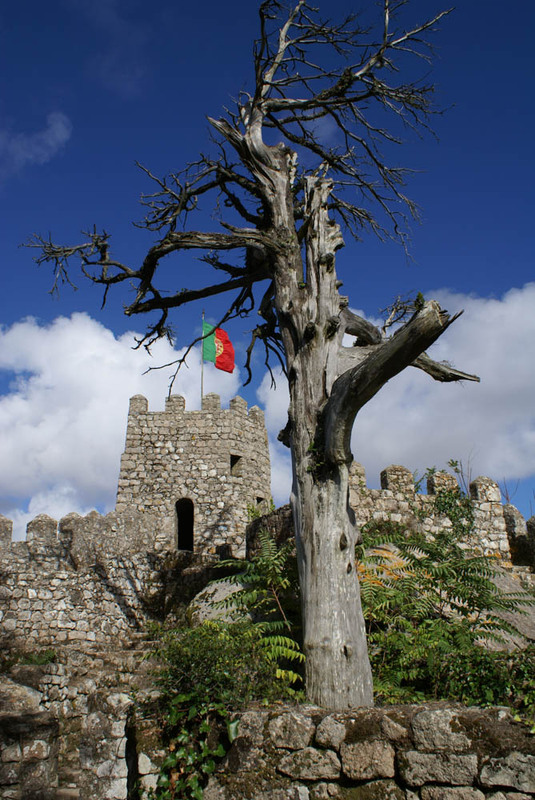 Obidos is a small picturesque town with a well preserved town wall and medieval castle. It is a popular tourist destination as the town is medieval in character. Every year it hosts a two-week medieval festival though we were not there to see it. Nazare is a well-known beach and fishing village on the Atlantic coast. It has a beautiful wide beach and a high bluff that overlooks the beach. A funicular takes people from the beach to the upper part of the town. In recent years Nazare has become famous for the high surf that comes rolling in from the Atlantic. The waves are reputed to be the largest in the world, as high as over 100 feet, and arise because of an off-shore underwater canyon. The waves are so high that the city has become the site of international surfing champioships. View of the scenic beach at Nazare from the upper town. The Monastery of Alcobaca is an important structure in Portuguese history. In the monastery are the tombs of King Pedro and the love of his life Ines de Castro. Pedro’s father, the King at the time, opposed his son’s marriage to Ines and ordered her murdered in front of her children. In retaliation when Pedro became King he ripped the hearts out of the killers while they were still alive and forced the nobles, clergy and peasants to kiss the dead queen’s hand. He’s sometimes known as ‘cruel Pedro’. Her tomb lies next to his in the Monastery and sits on images that represent her killers. Conimbriga is the site of an extensive old Roman ruin. It is the best preserved Roman settlement in Portugal and has a large museum. The city walls are largely intact as well as the foundations and mosaic floors of many houses. Tomb of King Pedro in Alcobaca. Tomb of the murdered wife of Pedro, Ines de Castro. The tomb rests on human figures that represent her killers. The oldest and most prestigious university in the country is in Coimbra. Apparently we were there just after the end of the semester and graduation so there were some events associated with graduation. It is a tradition for students to wander the town in black gowns and serenade passers-by. We ran into several groups of students, one of which asked us to take their picture while they posed in front of the university courtyard. We took their picture with my camera and emailed the picture to them afterward. I also bought a t-shirt that one of the groups was selling, from an engineering major. At the restaurant we dined in, there was a large table of celebrating students. At night we looked for fado singing but the character of the venue as well as the singing seemed quite different from what we saw in Lisbon. Gathering of students at the University of Coimbra. Some of the students are wearing the ceremonial gown for going around the town. Statue of King João III, who based the university in Coimbra. Biblioteca Joanina at the University of Coimbra. The ruins of this medieval castle are located on a small island in the Tagus River. There is a small boat that ferries visitors from the mainland to the island.